FIRE DRILL - BRUCE 2017 $40.00 df 30" M 5.50 Dip Dor. Our second Dip. introduction with more to come. Garden visitors urged me to introduce this clear pinkish red with a large green throat. Flowers are flat and have great substance. A great rebloomer with almost instant rebloom here in SC. The parents are: H. SILOAM FASHION QUILT X H. SPRING MYSTIQUE. Not exactly what I expected when I made this cross. Dormant. DOUBLE SHIFT - BRUCE 2017 $30.00 df 26" EM 5.75 Tet Dor. Intense colors including the tangerine eye. Fertile both ways over the season and the parent of future double introductions. From a long line of my double seedlings going back to a cross of H. LAYERS OF GOLD X H. HOTSY TOTSY. Another dormant. CAPTURE THE MOON - BRUCE 2017 $40.00 df 31" M 6.0" Tet Dor. 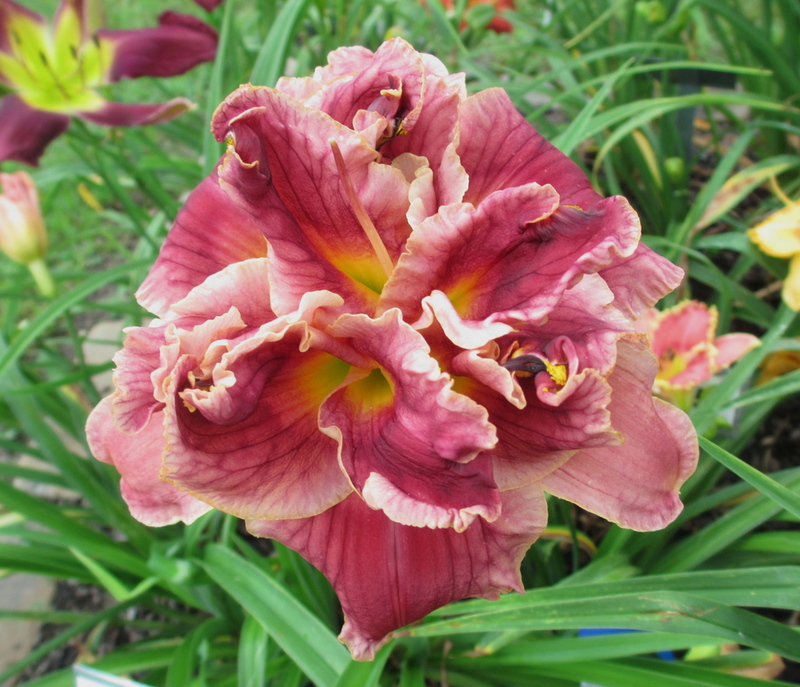 A double that is both a rebloomer and a dormant. Ivory yellow 6" blooms with a lime green throat and 31" scapes. From H. MEMORIES OF PARIS X H. HAMPTON CLASSIC. Limited supply so order early. SCENIC OVERLOOK - BRUCE 2017 $30.00 df 35" M 11" Tet Sev. Tall at 35" and large blooms with a bold chevron burgundy eye pattern. Bold green throat too! Good increase and rebloom. H. WILD AND WONDERFUL X H. HEAVENLY STARFIRE. TIKI TORCH PARTY - BRUCE 2017 $30.00 df 33' M 6.25" Tet Dor. A 98% double in my SC garden with good rebloom. From H. SOLID MAHOGANY X one of my double seedlings that was never introduced. The 6.25" blended blooms stand on strong 33" scapes. We think the name says it all. FLY OVER - BRUCE 2017 $40.00 df 32" EM 10.25" Sev. It twists and turns and has large blooms with bold green throats. An early bloomer in SC. From H. COOL TWISTER X H. TRIASSIC TEETH. COME SEE THIS - BRUCE 2017 $30.00 df 32" M 8.5" Tet Sev. The name comes from a garden visitor that yelled - "come see this" - to a friend. Great plant habits including rebloom and rapid increase. Strong 32" scapes and 8.5" flowers. From the cross of H. COOL TWISTER X H. CLIFFS OF ABIQUE. HEART WIDE OPEN - BRUCE 2016 $30.00 df 28" M 5.5" Tet Sev. Our second introduction from H. DOROTHY AND TOTO breeding. A sib to last year's H. TALK ABOUT FLASHY (H. SIGNATURE TRUFFLE X H. DOROTHY AND TOTO). This rosy pink double has a wide tan border surrounded by a thin gold edge. One of our most popular doubles with garden visitors over the last few years. Good pollen. HARVEST BONANZA - BRUCE 2016 $35.00 df 28" EM 5.5" Tet Sev. Out of the hundreds of crosses we made, (H. FESTIVE FALL X H. CITRIX), we only kept three. This is the first one to be introduced. The golden yellow watermark and deep lime green throat combined with the tangerine orange flowers really makes the blooms glow across the garden. Fertile both ways and a strong increaser. ONLY A FEW! GARDEN BOUND - BRUCE 2016 $20.00 df 30" M 5.5" Tet Sev 98% Double A great garden double we hope will soon be garden bound for you garden. This peach double with a faint pink eye comes from a long line of double breeding. This is one of my first doubles from H. TETRA DOUBLE OLD IVORY. Look for many more from this line of breeding in the next few years. Fertile both ways with a number of seedlings under evaluation. (( H. JOHN KIRKLAND X H. HAMPTON CLASSIC) X H. TETRA DOUBLE OLD IVORY)). In SC we have only had 2 single blooms since it first bloomed as a seedling. BORN IN CAROLINA - BRUCE 2016 $20.00 df 28" M 6.25" Tet Sev 96% Double The large peachy pink flowers (6.25") command attention across the garden. Additionally H. BORN IN CAROLINA has a nice green throat. Another introduction from my H. TETRA DOUBLE OLD IVORY program. (H. JOHN KINNEBREW X H. TETRA DOUBLE OLD IVORY). Fertile both ways which is always nice in a double. TALK ABOUT MEMORIES - BRUCE 2016 $20.00 df 30" M 5.25" Dip Dor. My first DIP introduction with many more to follow in the near future. H. TALK ABOUT MEMORIES is the third in the "Talk About" series with both parents from Jack Carpenter. ( H. KANSAS KITTEN X H. KALEIDOSCOPIC INTRIGUE) The cross gave me a plant taller than both parents and rose pink blooms with a fuchsia eye. Fertile both ways with many seedlings under evaluation. LONG WINDING ROAD - BRUCE 2015 $20.00 df. H. LONG WINDING ROAD - BRUCE 2015 $20.00 df 35" M 7" Tet Sev. From H. THIN MAN breeding. Large and tall just as I envisioned when I made the cross. The large green throat makes the flower shine across the garden. I used this one in my UF breeding and I have already seen some nice seedlings that should be introductions in the next few years. It twists and turns and provides a great sense of movement in the back of a border. Very pollen and pod fertile. RED RAGTOP - BRUCE 2015 $20.00 df. H. RED RAGTOP - BRUCE 2015 $20.00 df 29" EM 5.75" 100% Double Tet Sev. From my red double line crossed to H. DOUBLE IMAGE. A clear red color with white edging. Always double and a good increaser. Both pollen and pod fertile. The darker red eye is more pronounced as the season progresses. H. TALK ABOUT FLASHY - BRUCE 2015 $50.00 df 28" EM 5.5" 100% Double Tet Sev. We don't have many full doubles in this color class. The flowers are fushia with a wide band of lighter edging. The parents are two great double parents. (H. SIGNATURE TRUFFLE X H. DOROTHY AND TOTO) A few more of the siblings are scheduled as future introductions. Fertile both ways. We have heavily used H. TALK ABOUT FLASHY in our toothy double program. We should see many more seedlings next year. VERY LIMITED! H. TURN DOWN SERVICE - BRUCE 2015 $20.00 df 23" EM 6" 98% Double Tet Sev. I have only seen one single bloom since the initial bloom. The rose pink flower has a hint of a darker eye surrounding the green throat. The white edging enhances the flower. A good pod parent and you do get some pollen to use over the bloom season. ((H. TETRA SILOAM DOUBLE CLASSIC X H. TETRA NAGASAKI ) X (DOUBLE IMAGE)) A front of the border introduction with great form and plant habits. You will feel very special when you have H. TURN DOWN SERVICE in your garden. H. FAMOUSLY HOT - BRUCE 2014 (Sorry - sold out) $50.00 df. 25" EM 5.0" 95% Double Tet Sev. An orange red double with a gold serrated edge. Fertile both ways. Bloom varies day-to-day. H. SMALL TOWN FRIENDLY - BRUCE 2014 $20.00 df 28" M 5.25" Tet Dor. A good front of the border pink with a deep green throat. Ruffled gold edges with yellow gold shark's teeth. From H. Heavenly Pink Fang breeding. H. MORNING APPOINTMENT - BRUCE 2014 $20.00 df 30" M 5.75" 100% Double Tet Sev. Pink double with deep rose eye. From a long line of double parents. H. STAND UP AND CHEER - BRUCE 2014 $25.00 df 37" M 7.0" Tet Sev. The flowers are orchid with a lighter watermark above a lime green throat. The petals have a yellow gold serrated and toothy edge. Definitely a stand up and cheer about flower. From H. Triassic Teeth breeding and very fertile both ways. A nice back-of-the-border offering with excellent branching. RED ALL DAY - BRUCE 2014 $15.00 df. H. RED ALL DAY - BRUCE 2014 $15.00 df. 30" EM 5.25" 100% Double Tet Dor A great garden plant. Garden visitors really convinced me to introduce this 100% double. 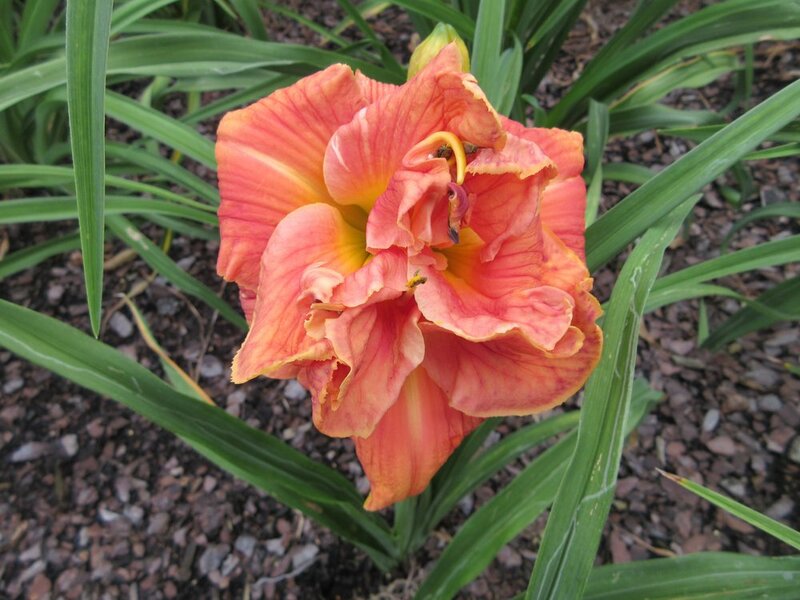 The red flower is enhanced by the wide tan edging. It makes a clump quickly and at 30" is taller than the average new double. You can use this one in the middle of the bed. A deep lime green throat is an additional plus. From a whole line of my dormant double seedlings. ((H. CHINESE SCHOLAR X H. FIRES OF FUJI) x ( H. TETRA SILOAM DOUBLE CLASSIC X H. TETRA NAGASAKI)) Pollen and pod fertile. Not a cutting edge double but a great garden plant with a great price.